The Language and Cognitive Development domain of the Early Development Instrument (EDI)** includes reading awareness, age-appropriate reading and writing skills, age-appropriate numeracy skills, ability to understand similarities and differences, and ability to recite back specific pieces of information from memory. 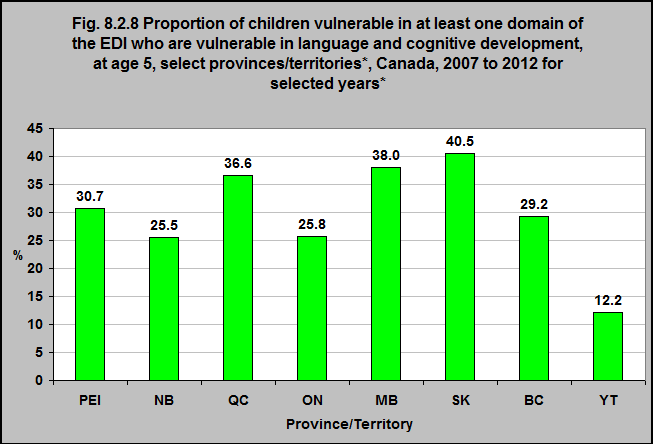 40.5% of all children in Saskatchewan who are vulnerable in at least one area of the EDI are vulnerable in language and cognitive development. 12.2% of the children in the Yukon who are vulnerable in at least one area of the EDI are vulnerable in language and cognitive development.